Date/Time - 27 Aug (Saturday), 4 p.m. – 6 p.m. Description - DISCIPLE Bible Study first started in Flower Mound, Texas, and came to Singapore in 1990 when the Rev Lily Castor conducted the first DISCIPLE Leaders’ Training for a group of Methodist pastors. In 1991, Bishop Richard B. Wilke and his team, including Mrs Wini Grizzle, the then-Director of DISCIPLE under United Methodist Publishing House, introduced DISCIPLE to Singapore upon the Rev Castor’s recommendation. 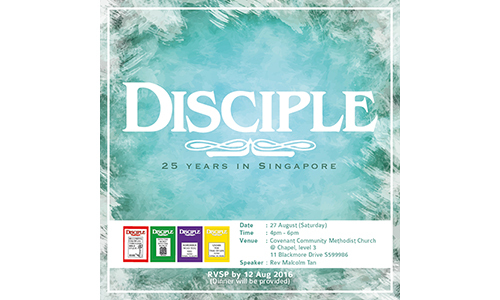 If you have been blessed by DISCIPLE, do join them at their 25th anniversary service this year. Organised by Disciple Agency. Register by 12 August. Dinner will be provided. For more info, visit www.disciple.methodist.org.sg, email disciple@methodist.org.sg, or call 6478-4755 or 6478-4756.